Somewhere between Chinatown and the lights of Dundas Square lies an all-day dim sum treasure easily overlooked by passersby. Not that I'd blame anyone for missing it... it is, after all, tucked away in a basement space, but there are plenty of neon arrows glowing above the staircase to help you out. 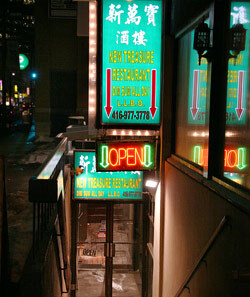 Follow 'em down, you'll find friendly service, a huge menu and great chinese at bargain-basement prices (of course!). 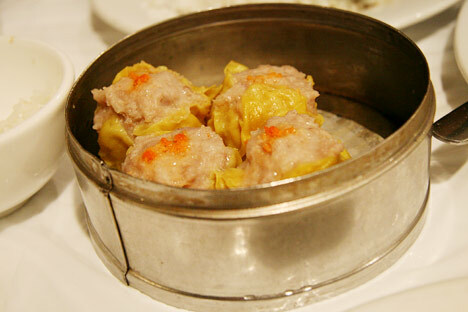 So then, first off, if you're a dim sum virgin, or have friends who are, this is a great place to start. The friendly New Treasure staff are happy to explain the dishes to you and provide you with a photo dim sum "menu" to supplement the usual carbon-copy checksheet. It's pretty much a rolodex of big dim sum photo flashcards... very handy for those who aren't sure what they're getting themselves into. In terms of dim sum, we ordered up some classic picks. Stuffed Green Peppers : Stuffed well these pepper pieces were crisp and fresh tasting -- always nice. Siu Mai (steamed pork & shrimp dumplings): while we've had tasty siu mai elsewhere in the city, these stand out for their generous size (look at 'em!). Stuffed Eggplant : In my opinion, the best in the city. 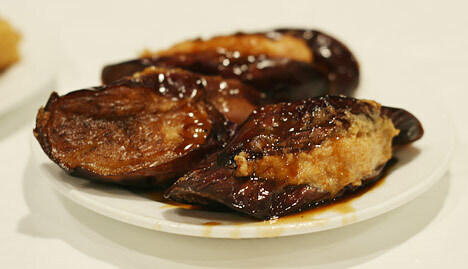 I generally never order the eggplant when I'm out for dim sum because it's usually shrivelled, overfried, brown on the inside and hard-skinned on the outside... not to mention drowned in sauce or oil. But, my girlfriend absolutely loves this dish, so I end up trying some every time anyhow. New Treasure's version is a nice large piece of eggplant, soft on the outside, white on the inside and stuffed generously... not to mention very flavourful. I could have easily gobbled up all three pieces. 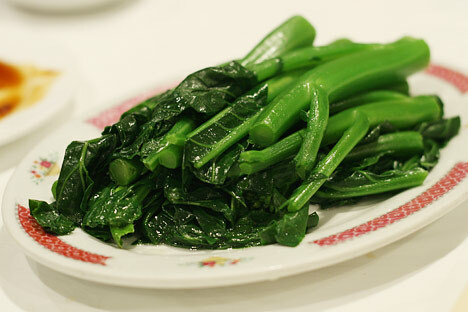 For the health conscious dim sum'er, a serving of steamed Chinese Greens with sauce on the side. These were just about steamed to perfection -- with just enough crunch to 'em without being too raw. The only improvement I might ask for here is a little chopped garlic. Mmm. 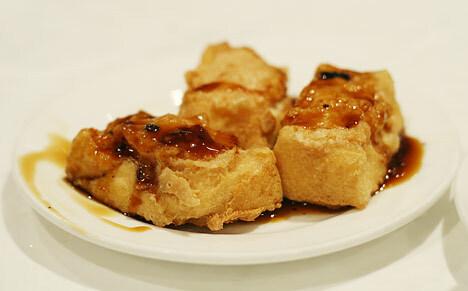 And oddly enough, another 'stuffed' choice: Stuffed Tofu . This dish would set the standard for what tofu was going to be like this evening. Whether fried or braised, it was always tender and never overdone on the inside. 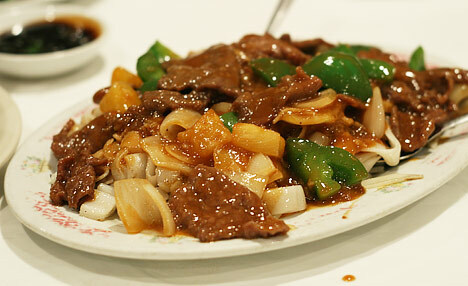 Beef Rice Noodles with Satay Sauce : Thick ribbon style rice noodles with tender beef, green peppers, onions and pineapple. The noodles were a little stuck together, but still pretty good. Again, the vegetables were fresh tasting and the beef very nice -- not chewy at all. 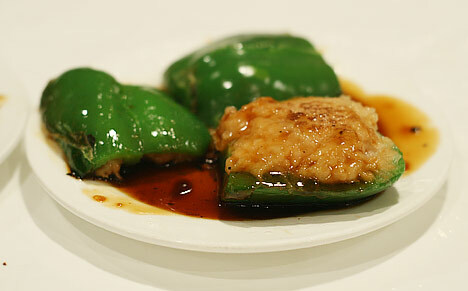 Pictured at the top is the Braised Bean Curd with Vegetables . This one was a pleasant surprise as we were expecting bok choy and mixed vegetables but instead got a lot of steamed broccoli and huge savoury mushrooms (my favourite). The bean curd/tofu and sauce was placed in the middle so that the broccoli didn't get smothered with sauce before its time... another nice touch! For the chicken-lovers at the table: Lemon Chicken . No mystery chunks of breaded chicken here.. just lovely white meat, lightly breaded and served up with onions and fresh lemon slices!. Now, be prepared to taste lemon if you order this dish. 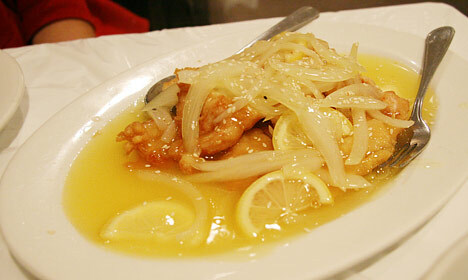 I know that might seem obvious, but I've never had a lemon chicken dish that was this lemony. Personally, I really enjoyed it, but some others thought it was too much. You'll just have to try. Finally, we decided to get a hot pot from their eight pot selection. 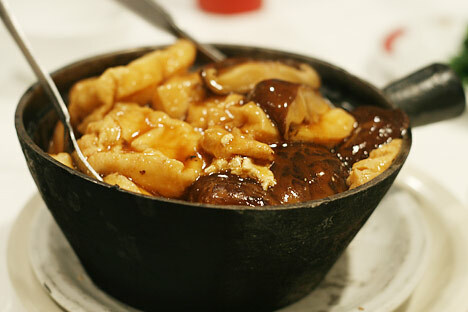 Chinese Mushroom & Bean Curd served up in a steaming hot pot. Large slabs of sizzling bean curd/tofu along with huge mushrooms, this was a highlight of the meal. Tofu made some new fans in our group with that pot, one of which when asked for a quote, replied, "SCRUMDIDDLYUMSCIOUS." It isn't hard to see why, after stumbling upon New Treasure in my wait for a Greyhound bus a year ago (the terminal is steps away), it has quickly become one of my favourite Chinese eateries in Toronto. Open from 11 a.m. to 11 p.m. and offering a full menu (as well as dim sum) that whole time, I'll be coming back again and again.